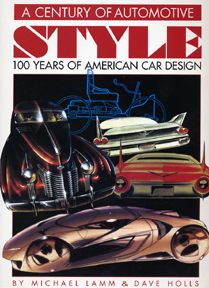 The definitive history of American automotive design, complete with designers' biographies, coachbuilder histories, descriptions of car company styling departments, discussions of trends, etc., lavishly illustrated. Michael Lamm has written and published half a dozen books about cars. He worked as Motor Trend's managing editor, and co-founded Special-Interest Autos in 1970. His writing partner, Dave Holls, retired in 1986 as design director for General Motors. This rare book is no longer in print and according to the author will not be republished.